"The Lobster Pot was Made in Mane and then shipt to here and then got put in the water by a Lobster Man got cot in the storm Broke free and washed up." -- Everett and Kent Healy, and Gregory Clark, at the Earth Day beach clean-up, in response to a survey question asking kids to take a guess as to where an item they found came from. Saturday, May 5*, 9:00 to 11:00 am, Felix Neck Wildlife Sanctuary. 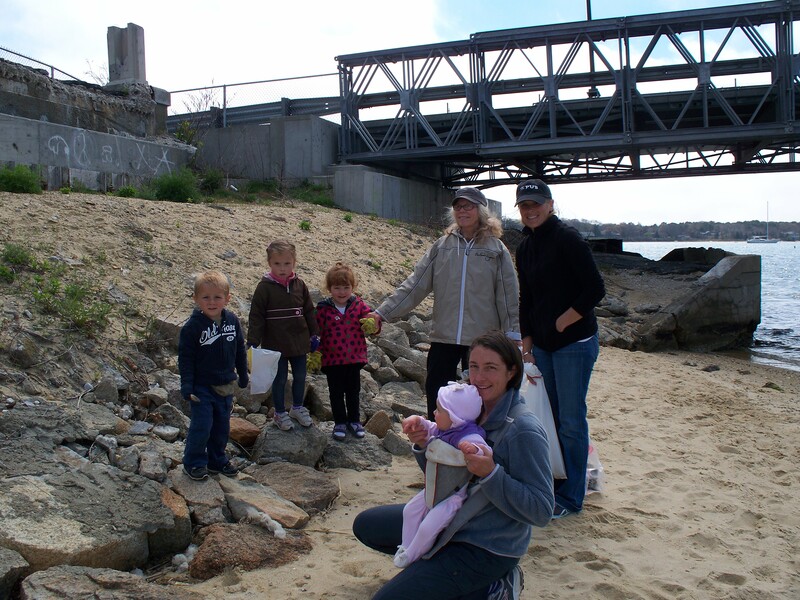 Train to become a volunteer to help Felix Neck monitor island horseshoe crab populations. Returning volunteers welcome. Dress for the weather. Please wear shoes that can get wet. For further information and registration (reg. is required), please call Felix Neck at 508-627-4850. Saturday, May 5, 9:00 am to noon, Chappaquiddick. Bring your own work gloves, rakes & shovels to Mytoi on Chappy to help with the spring cleanup and planting. For more info, call 508-693-7662. Saturday, May 5, 9:00 am to noon, at The Polly Hill Arboretum. The traits most often used to indentify trees—leaves, buds, twigs—are often not clearly visible or, in the case of leaves, absent more than half the year. Join author and naturalist Michael Wojtech for an exploration of bark, the tree characteristic that is always visible in every season. Michael will be available to sign copies of his book, Bark: A Field Guide to Trees of the Northeast. $20/$10 for PHA members. Sunday, May 6, 1:00 pm, Edgartown. Join Land Bank staff for a guided walk of about 1.5 hours at Poucha Pond Reservation. Rain or shine, dress for the weather and wear sturdy shoes or boots. For more information, call 508-627-7141. Sunday, May 13, 10:00 am to 2:00 pm. The leaves of Chenopodium berlandieri, a very common -- even weedy -- species of Goosefoot. Lambs quarter, described by Michael Pollan as "(one of) the most nutritious plants in the world,” is a common weed with a taste similar to spinach. This post by Meredith Bethune at Farm to Table provides a nice description of the plant and this tasty and versatile recipe serves as a good entry to one of the less intimidating local foraging options. For the experienced foragers, what else could you substitute here? (I am certainly not one, but I might replace half the lambs quarter with sorrel to replace the lemon.) Can anyone make it completely wild? Place a pot of water to boil on the stove for the pasta. Warm the olive oil and chili flakes in a skillet and add the onion and some salt to taste. Saute for about 10 minutes on medium heat until the onion is translucent. Add the anchovies to the onions and break them up with a window spoon until they hve dissolved into the vegetable mixture. Add the greens and sautee over medium heat until wilted, then add flavor with the lemon juice. Cook the spaghetti in boiling salted water until al dente. Drain the water and add it to the greens. Season with salt and freshly ground paper, and toss well to evenly coat the spaghetti. Thanks also to everyone who contributed photos of their experience, including Patti Leighton, Alison Mead, Elizabeth Rothwell, and the staff and board of VCS. To anyone else who has any pictures that they would like to share -- please do! A slideshow is currently running on the VCS homepage; we'll add more photos as they come in. Of course, the clean-up is but one day, and isn’t enough by itself to keep our beaches clean and our wildlife safe from floating plastic and toxic chemicals. But like Earth Day itself, the more important part is not in doing the right thing 1/365th of the time, but in raising awareness of how our actions, both individual and collective, impact the natural environment. Sometimes it is motivational: kids who come out for the beach clean-up are, in the future, more likely to put in the effort to pack-out their trash and encourage their families to do the same. Sometimes it is the raising of questions: Given the large amount of politely bagged-in-plastic dog poo found, does it do more harm than good to encourage beach visitors to use the bags? And sometimes the message is perplexing, even when striking: What are we to take from the presence of a couch on Lucy Vincent Beach? With greater public involvement, tracking the occurrences and spread of problematic invasive species could become easier. A joint project between the state Department of Conservation and Recreation and the Center for Public Policy and Administration at UMass Amherst seeks to enlist technology to make it easier for the public to contribute. A smartphone app has just been released that will allow anyone with an iPhone or Android to submit their invasive sightings while on the go. Also, for those of us still chained to our desktops, it is also equally possible to help with the data collection by submitting photos through a web-based application. Part of the Blue Marble project, NASA, 2010. Not many of us will ever have the opportunity to experience that perspective in person, but thanks to improving technology, the visual images are increasingly clear and life-like. Researchers at NASA have undertaken a sort of composite photo project called “Blue Marble” that offers the best simulation yet. See NASA for the history of how it was created, or go over to Flickr for images and even an animation. National Geographic has released the winners of their newest photo competition, an amateur contest for underwater photography. Many are spectacular, including of course the overall winner, featured on the first page of the slideshow. In fact, all of the winning macro (or ultra-close-up) photos are, because they are so effective at making the viewer see the world from a completely different perspective, in a way that a shot of a whale – while awesome – simply doesn’t.